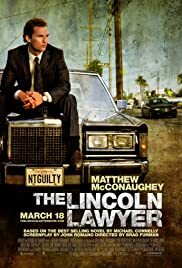 BEFORE: In honor of the season premier of the greatest show on television, Breaking Bad, I’m watching The Lincoln Lawyer in which Bryan Cranston has a minor role. But really, this is just helping me pass the time until Walter White comes back on the air. All hail the king. AFTER: The Lincoln Lawyer is yet another crime mystery film which, unintentionally, makes it the fourth one in five days. The story took quite an interesting path from beginning to end. It really transforms from what seems like a basic, seen-this done-that type story in the beginning, into a rather complex and puzzling mystery by the end. As Mickey Haller (Matthew McConaughey) gathers more bits of evidence for his case defending Louis Roulet (Ryan Phillippe), more elements of the puzzle begin to unravel. By the end, it’s gone from the one case to about four or five different cases which are all beautifully intertwined with one another. There’s also some great acting going on as well. McConaughey does a great job both in and out of the courtroom; much better than his performance in Contact which I did not care for. Ryan Phillippe is still a bit shallow, but he has improved quite a bit from his performance in Cruel Intentions. When he’s sitting on the stand and explaining his story to Haller, there is lots of passion, but that fades away for most of Roulet’s other scenes. And of course, Bryan Cranston amazes despite only having about five lines in the entire film. One thing I didn’t like was the films use of shaky-cam. Shaky-cam is a technique used to give films a more documentary-style look and feel, giving the viewer a sense that they’re in the scene as the action’s happening. It worked well in some scenes, especially the walk-and-talks Haller has with various colleagues, clients, and the like. But there were many other scenes where it was completely unnecessary. The best example of this is the opening shot. Haller pulls up to the courthouse and gets out of the car. The camera is placed inside the car and zooms in on Haller as he walks up the steps. No. There is no reason to use shaky-cam here. It’s not adding anything to the story. When it’s used after he enters the court and Haller is walking all over the place, that’s a good use; it adds a sense a realism that augments the story and gives the viewer an idea of what Haller does.